Whiskey Smash Cocktail | Working from home has its pros and cons. Con it’s easy to procrastinate and get distracted. Pro, I am in control of my schedule which allows me the ability to travel along with my husband on his business trips. One of these trips took him to Chattanooga, TN. So, we loaded up the pups and hit the road to one of the cutest towns I have ever been. After a week in Chattanooga, I was totally in love. It’s small but not too small, they have great hiking and a fun food scene. I know I’m from a Caribbean island but I have mad love for the mountains. I love the crisp air and beautiful forest. Many times I dream of building a cabin in the mountains. While visiting Chattanooga, we went out to dinner at a hip hamburger restaurant called Urban Stack. Their menu is fun with Southern classic appetizers like fried bologna sliders, hot pimento cheese dip, and homemade pickles. Their main menu is an array of hamburgers. They have everything from a classic bacon cheeseburger to an Asian-Q burger with wagyu beef, wasabi savoy slaw, Asian ginger barbecue sauce, homemade cucumber kimchee and five pepper dry rub. I had the Asian-Q, it was amazing! Also, beware of the homemade pickles they are uber addictive. Along with their fabulous food menu, they have an equally fabulous drink menu. I’m not much of a drinker because I flush red when I drink alcohol, and my body temperature goes up about 20 degrees. But, their drink menu looked so fun I thought I would give one cocktail a try. They also boast having 100 whiskeys to choose from, because what says Tennessee more than whiskey. I decided to try a whiskey smash. I’d never had a whiskey smash cocktail before but, I was in Tennessee, and it seemed fitting. It was perfect! The perfect cocktail to enjoy on a summer day while sitting on the porch with friends or to warm you up on a cold winter day. Before my visit, I had never heard of a whiskey smash. When I asked the server to explain the cocktail to me he described it as a mint julep with a citrus twist. That is the perfect description. 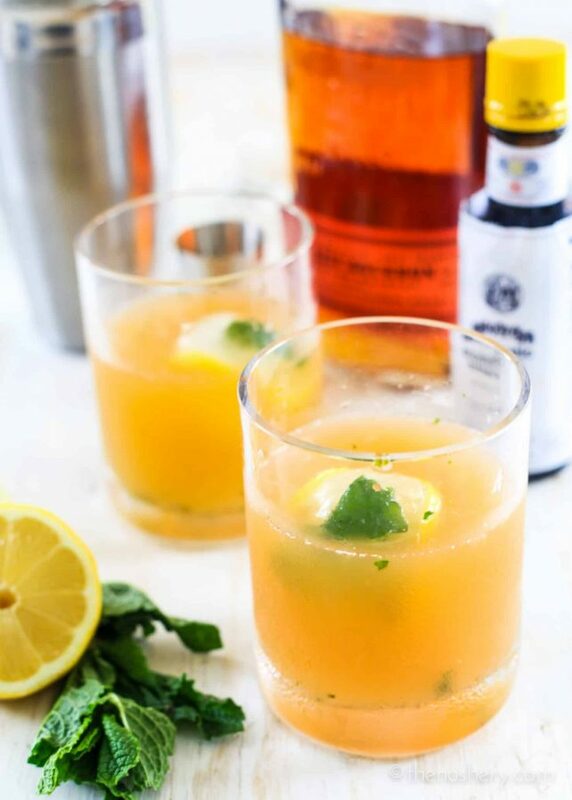 Both the mint julep and whiskey smash are cocktails with deep southern roots. Both cocktails are made with whiskey, mint, and simple syrup. However, a whiskey smash is also muddled with a lemon wedge. 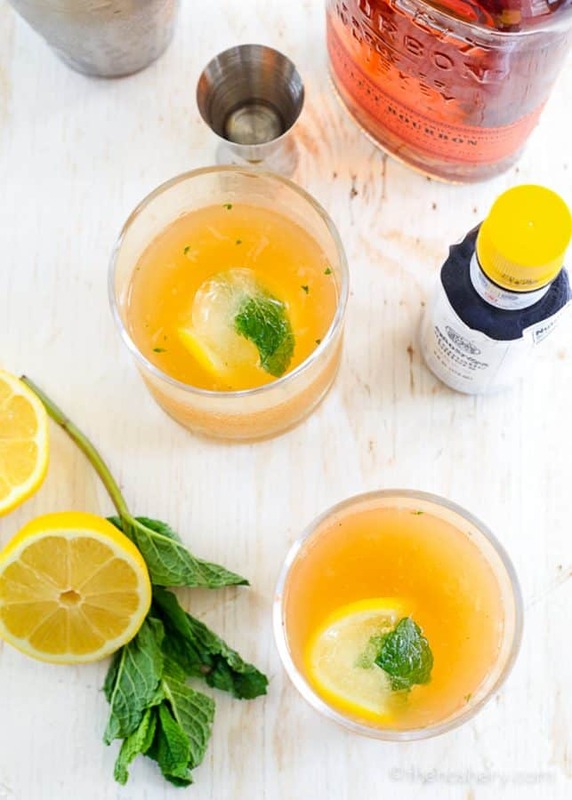 You can easily experiment with a whiskey smash by using different kinds of citrus like Meyer lemon, lime, orange, or blood orange. Ever since our visit to Urban Shack I have been obsessed with the whiskey smash drink. OBSESSED! So much so I had to create my own whiskey smash recipe. If you don’t have a muddler the handle of a wooden spoon will work fine. A batch of simple syrup can be quickly prepared by combining a 1:1 ratio of sugar and hot water in a jar and shake vigorously. Seasoning a cocktail with a few drops of angostura bitters amplifies the flavor of the cocktail. Think of bitters is to cocktails like salt is to food. 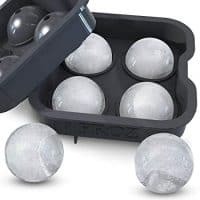 Ice spheres or large ice squares melt at a slower rate. The larger the ice cube the longer it will keep your drink cool and the less it will water down or dilute your drink. If you don’t have a cocktail shaker you can use a container or jar with a lid and a fine mesh strainer. 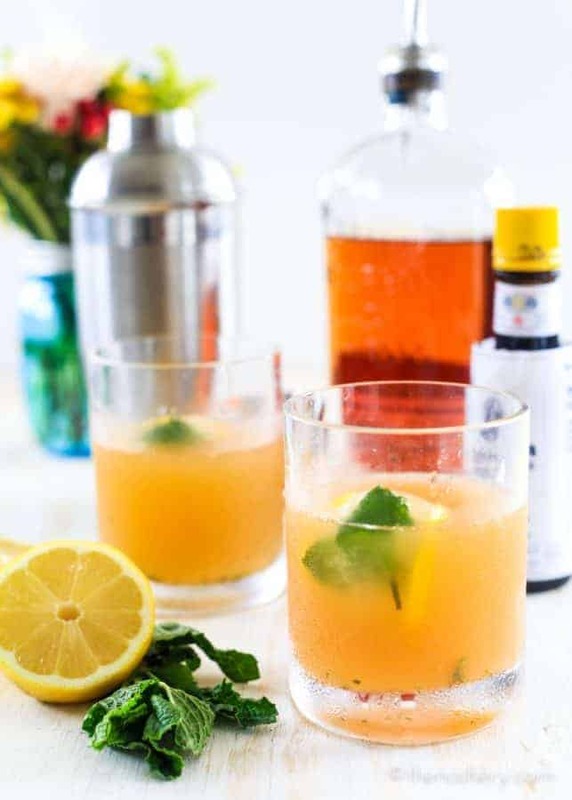 A whiskey smash is smooth and tart, muddled with lemon and mint, and then lightly sweetened with simple syrup. It’s like a grown-up version of lemonade or the sassy cousin of the mint julep. If the mint julep is more your speed maybe try this elderflower mint julep. If you like your cocktails spicy you will love this spicy pineapple margarita. And, if you still want a minty cocktail but are more into rum then whiskey you will love this cherry limeade mojito. Need more cocktail or drink ideas visit my drink page. Enjoy your cocktails in moderation with friends! The Whiskey Smash is whiskey muddled with lemon and mint. It is then lightly sweetened with simple syrup. I like to call it the citrusy cousin of the Mint Julep. 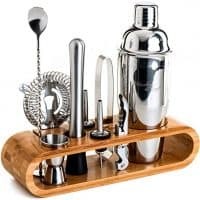 Using a muddler or the handle of a wooden spoon, mash mint leaves, lemon and simple syrup in a cocktail shaker. Add whiskey, bitters, and crushed ice, shake vigorously. Pour into Old Fashion glass over large cocktail ice. Garnish with mint sprigs. It sounds like a whiskey mojito +the bíters! Sound refreshing! Seems like a nice fresh drink.